The Full Moons for 2018 completely snuck up on me. More often than not, I was disconnected from the nighttime ebb and flow. After a years worth of Box of Shadows subscriptions, and putting everything Esbat related aside for next year, which is now this year, because I wasn’t ready for it then…I’m planning my year ahead now. Candles, divinations, rituals, the works. I’m great at planning. 1/3 of my job is planning, and sometimes it feels like that it is my favorite part! So, here’s to 2019, and a plan for the nighttime seasonal flow through the year. 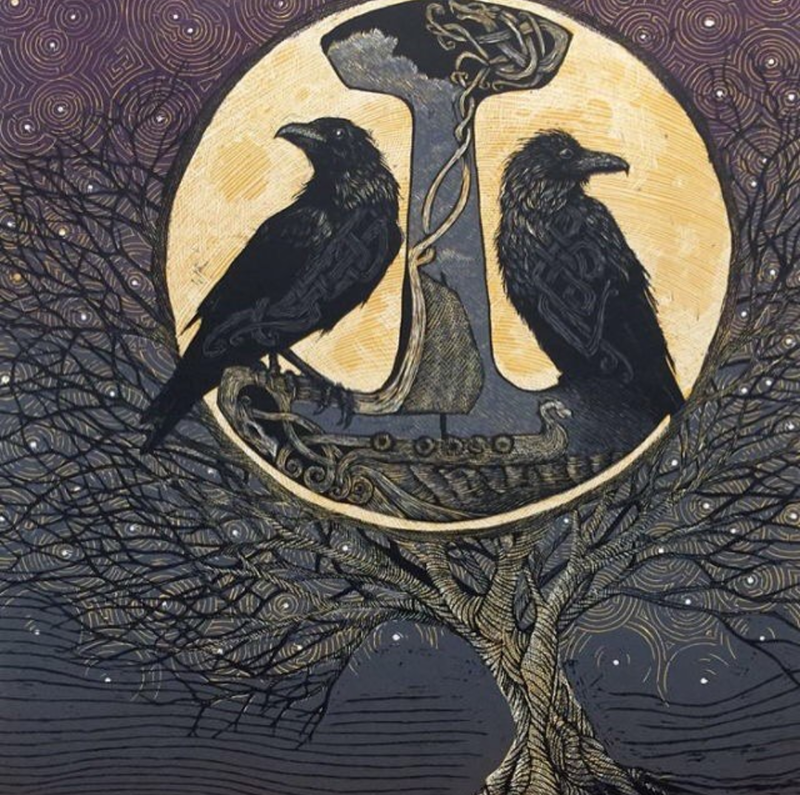 Friday night, on Frigg’s day evening, I co-led a Full Moon ritual dedicated to Frigg. It was a lovely night, with wispy clouds, as Witchlette calls them, Frigg clouds, hanging over the moon. Rather than quarter calls, I wrote calls which allude to the creation of the world as it is stated in Nordic folklore, with fire and ice creating the mist from where life sprang forth. Mist: Fire melts the ice. The water mixes with the heat to make steam. The ice cools the steam to make mist. The mist fills the gap between fire and ice, where there was nothing. Mist of the world from where all life springs. Fire, Ice, Mist together: We are shrouded now in the mist, no longer in this world yet not wholly in the otherworld. We walk the space between, in the mist, blessed by fire and ice. R and I shared lines throughout the ritual. We invite you here, now, Beloved Frigg Allmother hail and welcome. We inserted our personal family histories and our own connections with Allmother into the ritual, connecting soft crafts, crocheting, sewing, knitting, weaving, stitching as all ways to honor her. Then shared a piece of Folklore to honor Frigg. The only surviving lore of Frigg have her as a co-star, either to Odin or Balder. She doesn’t have any stories surviving in her own right. There is, however, another who does. An alternate title for Frigg is Holda, a German figure from folklore who was clearly once a deity. It is widely accepted and understood that these two are different names for the same entity, and in my experience they answer to both. This piece of lore is of Holda, but contains a number of Frigg representations including spinning, weaving, fog, and flax seeds. Using Holda’s lore helps us to have a more complete image of Frigg, since she is her Germanic counterpart. There was once poor man who worked as a farmer. He and his wife worked long and hard each day. He lived in a small house on his land and tended to his animals. One day, while out in his field, he saw a woman on mountain. She walked up the mountain side and turned around a bend, and was out of sight. The man was intrigued by her, and followed her path up the mountain. When he went around the same bend, he saw a cave and went inside. Within the cave, were piles of gold and jewels, anything he could ever want for himself. In the middle of the cave, was a table with a bundle of small purple flowers. The man walked past the piles of wealth to the flowers. He thought how much his wife would love to have them, and he brought them home for her. She was grateful for his loving thoughts and set them in pottery with water. That night, the man dreamed of the woman, Holda, who thanked him for choosing the flowers, a gift of love, which, she said, would bloom everyday until the day of his death, and for choosing so would bestow upon him a gift. The next night he dreamed of picking seeds from flowers and sowing seeds, row by row. The next morning, he rose early to sow the seeds as he was instructed in his dream. That night, he dreamed again of how to reap them. He awoke early to the sight of early morning fog in his field, looking as if it was kissing each mound where he had sowed a seed the day before. Before his very eyes, he watched the small seedlings sprout up through the ground. Over the next day, the seedlings continued to grow and grow. One night, the man dreamed and Holda told him how to pick the flowers, pull fibers from the stems, spin the fibers into thread, and weave the thread into linens. The next morning, the man and his wife reaped the flowers, pulled the fibers from the stem, spun the fibers, and weaved. The made clothes for themselves. They sold fabric to neighbors who now had something besides animal skins to wear. They sold seeds to their neighbors and taught them how to sow and reap the flowers. The man went from a poor farmer to wealthy merchant. Many years later, surrounded by his grown children and young grandchildren, all of whom were dressed in fine linen, the man looked upon the table and saw the flowers which sat upon it were brown and wilting. He pointed out the flowers to his wife, gave her a kiss, and walked up the mountain, turned round the bend, entered the cave, and was never seen again. For Cakes and Ale, R and I led a blot to Frigg. We started by honoring the Asynjur. While R honored them with name, I lit a candle to honor each. R and I filled our personal drinking horns with juice, and lifted them high while we continued the Blot. 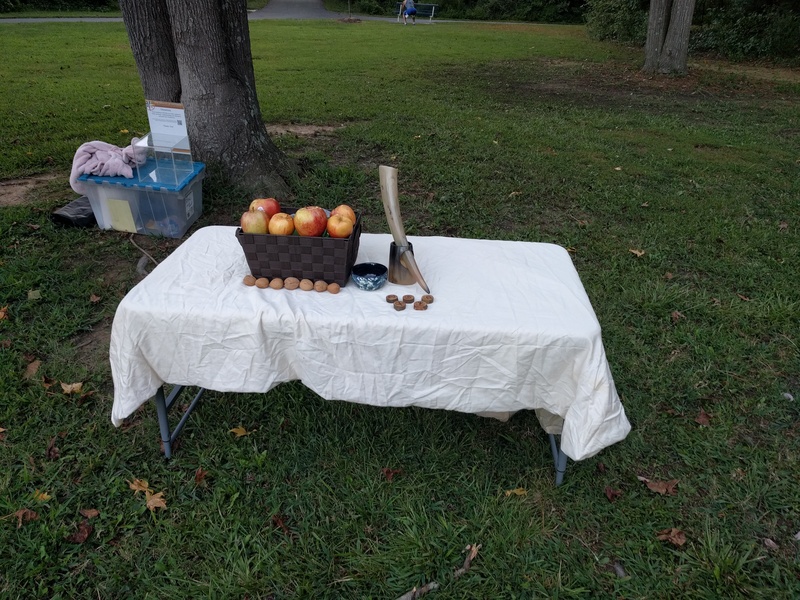 At this point, we passed out cakes and ale and some folks shared their own personal stories with handicrafts as we enjoyed cider and Northmenbrod. We then closed the circle. Thank you for blessing your sons and dottirs this night. May we dutifully complete joyful woman’s work in your honor. Mist: As the mist condenses, we see the land from flesh, the mountains from bone, the rivers from blood, and the stones from teeth. As the mist recedes, we are hearkened back to the garden in the middle of Yggdrasil. When the mist evaporates, we are once again fully in our world and no longer between worlds. For the worm moon, Witchlette and I planted some bulbs. We started in pots, and when they strated sprouting, we moved them to the front garden. Witchlette has been patiently waiting and tending to them to do something other than green. 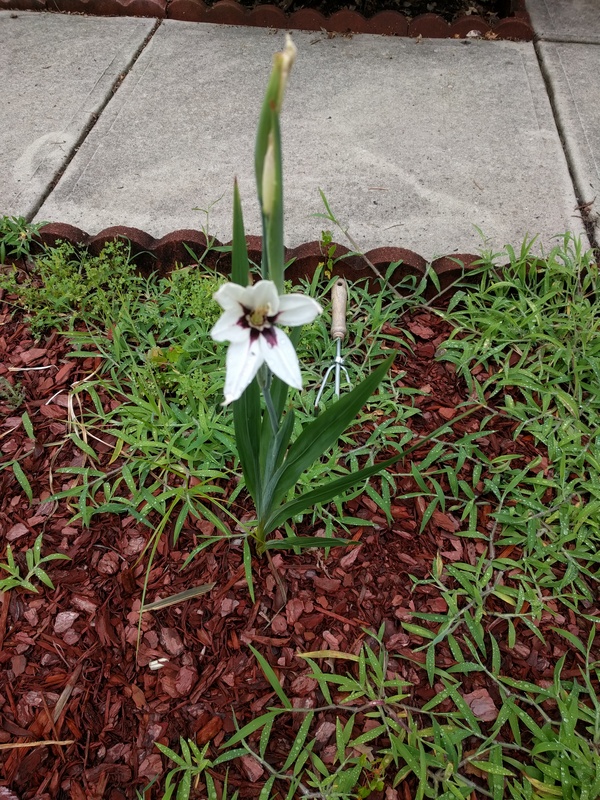 This morning, the first bloom opened.